To some they are a colourful symbol of the Philippines. To others they are an essential form of low-cost transportation. 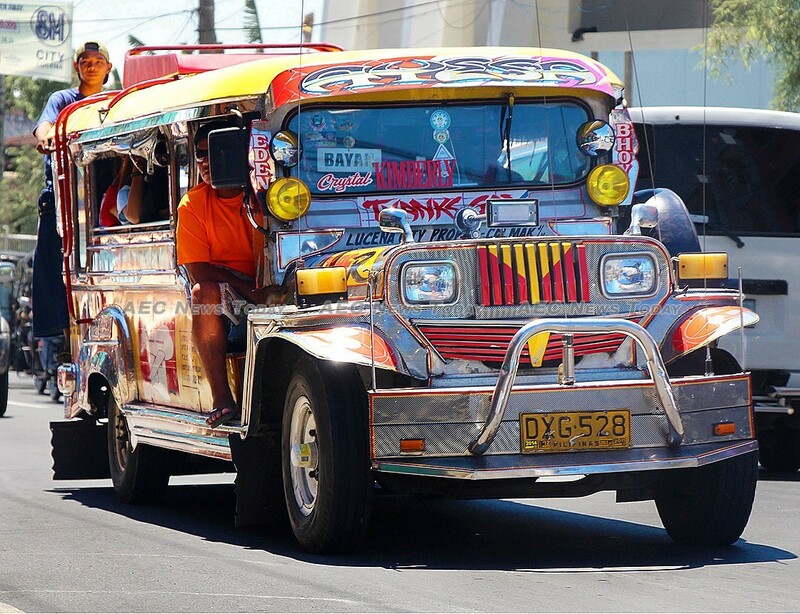 Others, such as Philippine President Rodrigo Duterte, see the humble Philippines jeepney as traffic jamming, greenhouse gas emitting environmental disasters on four wheels. A throw-back to World War II, highly modified colourful jeepnies have become an image that is recognised globally as representing the Philippines. Like many other icons that fade into history as societies mature and develop, so to is the Philippines jeepney’s future bleak. Often poorly serviced and maintained, many Philippines jeepnies are noisy, smoke-belching, fluid-dripping, mere shadows of the robust almost unbreakable Jeep® that they are based on. A five year PHP417.3 billion (about US$7.9 mln) government-backed Public Utility Vehicle Modernization Programme (PUVMP) aims to update the 180,000 or so licenced jeepnies operating in the Philippines. Replacing them will be low-emission, energy efficient buses fitted with Euro 4 diesel or electric powered versions. Confusingly both types are being termed an ‘e-jeepney’. At the same time jeepnies over 15-years-old that fail a vehicle inspection test are being taken off the road. 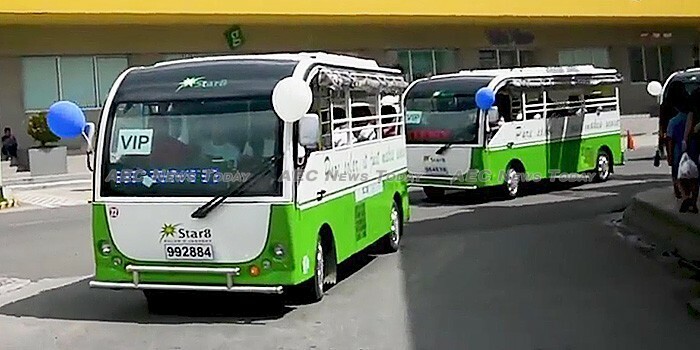 The plan has brought opposition from private jeepney owners who say they can’t afford to replace their vehicles, and the poor for whom the travel fare will rise. Others say the windowless, unairconditioned, knee-to-knee cramped Philippine jeepney of old fails to reflect modern-day life in the country. A vibrant, growing society should have more comfortable, efficient public transport, they say. Leading the charge with adopting the PUVMP philosophy was Star 8 Green Technology Corp., who in January commenced delivery of the first of some 48 solar-powered e-jeepnies for use on the Tacloban-Palanog route in Eastern Visayas. Fitted with traditional deep-cycle lead acid batteries, overhead personal ceiling fans, a LED TV, free Wi-Fi, and personal USB charging ports, the Star 8 solar-powered ‘e-jeepnies’ can carry up to 20 passengers, and have a range of about 120 kilometres (75 miles) on a single charge. Able to be charged from a standard wall outlet, the cost of one charge in the Philippines is about PHP80 ($1.50). Rather than being sold to the transport co-operative or drivers, Star 8 are donating some 2,000 e-jeepnies, with the hope of recovering their cost from the sale of advertising on almost every visible part of the vehicles. For their part the drivers must maintain their vehicles under a fleet management concept and operate them the whole year round. Earlier this week the trend continued with the first 15 of a fleet of 35 Euro 4-compliant diesel-powered 22-seat ‘e-jeepnies’ manufactured by Isuzu, rolling into action in Taguig City, Manila, with the Senate Employees Transport Service Cooperative (Setsco). The first of three transport cooperatives chosen by the Land Transportation Franchising and Regulatory Board (LTFRB) to participate in the PUVMP fleet implementation, the vehicles are funded under a PHP24.7 million ($46,000) Development Bank of the Philippines (DBP) loan at an interest rate of 6 per cent per annum over seven years. With a minimum fare of PHP10 ($0.19) and an additional PHP2 ($0.0.4) for each subsequent kilometer (0.62 mile), the new ‘e-jeepnies’ coincide with the introduction of set fares, and designated pick-up and set-down locations. Air conditioned, and capable of carrying up to 30 people, the ‘busnies’, as some people have been referring to the new design, also accepts contactless payment. A more traditional-appearing e-jeepney is the ‘green jeepney’ from local start-up QEV Philippines Electromobility Solutions and Consulting Group, Inc. (QEV Philippines). Made by local jeepney builder Sarao Motors in Las Piñas, National Capital Region (NCR), the home-grown modern-day ‘green jeepney’ mimics the original… minus the trade-mark Jeep® grill. Silent, responsive, and looking like a traditional Philippines jeepney in dire need of an airbrush artist, Sarao Motors told AEC News Today that despite strong interest, with no specific government incentives or programmes available for people wanting to buy a locally deigned and produced e-jeepney, there had not yet been any sales. Priced between PHP1.8 million and PHP2.3 million ($33,729-$43,000), the QEV Philippines/ Sarao Motors all-Philippine ‘green jeepney’ is slightly more expensive than the government’s ‘busney’ which costs PHP1.6 million ($30,000), but boasts zero emissions versus lower emissions. Under the PUMVP the Land Bank of the Philippines (LBP) and the DBP are offering seven year loans of up to 95 per cent of the cost of an e-jeepney at 6-8 per cent per annum interest, with the government responsible for up to 10 per cent of the purchase price. While Philippines jeepney drivers claim it is not possible to make money under the PUMVP finance structure, the Department of Transportation (DOTr) last year in a statement said: ‘All business models based on actual studies ensure profitability [for] the drivers or operators’. A lower cost option that QEV Philippines has urged the government to introduce would see 10,000 existing diesel-powered Philippines jeepnies per year over a five-year period retrofitted with an electric motor powered by lithium-ion batteries. According to the company the conversions can be done for about $10,000 without altering the external iconic Philippines jeepney exterior, with drivers/ operators gaining a bonus of about $800 a year from lower fuel and maintenance costs. In the meantime visitors to the Philippines shouldn’t be too surprised if their expected Philippines jeepney trip ends up being considerably more comfortable and less unique than expected, as the word ‘jeepney’ morphs into a generic description for a public transport road journey in the Philippines that most other countries would call a bus trip. Updated: This story was last updated at 7:54am on October 23, 2018. An incorrect conversion was applied to the cost of recharging and has been corrected. 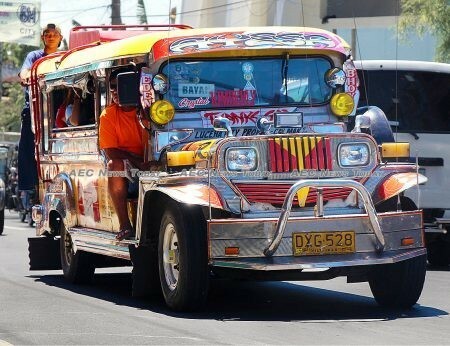 One Response to "Philippines jeepney phase-out gains pace: get on board a ‘busney’ (video)"
The Philippines needs $1.8 Billion USD to replace its transport fleet: the $7.4 million is trying to piss up a rope.